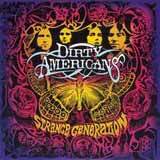 Dirty Americans is an intersting band out of Detroit, with Strange Generation being their debut album. The band is playing an interesting brand of hard rock, in the vein of 70's bands such as Led Zeppelin, Foghat, Black Sabbath, Blue Oyster Cult, and Gene Simmons fronted Kiss. The band isn't simply a 70's retro band, as they do have a modern element to their sound, adding some stoner sounds ala Monster Magnet and maybe even a nod to the reformed LA Guns. The plethora of influences keeps the music interesting and original, since they don't try to copy any one band or style. Despite the many obvious influences in the music of Dirty Americans, the band is able to mesh them all into a unique sound that manages to avoid the dreaded copy-paste sound. The overall sound of the album has a very vintage feel, with fuzzed out solos and vintage sounding riffs and grooves throughout. Strange Generation starts off with its strongest material in my opinion, a handful of sleazy, but catchy hard rock anthems with at times, downright silly lyrics. For example, Car Crash is likening a love relationship to a car crash. It's a fun song, with a catchy groove serving as the backbone to this cut. No Rest, Burn You Down, and the title track all fall in the same vein of catchy, good time 70's hard rock. Time In Space sees the band shift gears toward a more Monster Magnet like stoner vibe. Somehow, the band pulls this off without making the record sound disjointed. From there, the band goes for a post grunge, slower paced Creed like track in Give it Up. Admittedly, the band starts to lose me a little bit here. Dead Man sees the band return to form with a darker, but hard hitting track that might have fit comfortably on Kiss' Revenge album. Over the last six tracks of the album, I felt like the band settled into a pattern of mediocrity. Compared to the first 5 tracks of the album, the last 6 tracks just don't maintain my attention and stick with nearly as easy. Control features some really nice, very old school riffing, and Off The Deep End has an interesting "Swamp Rock" feeling to it. Other than that, I found the second half of the album to largely lack the punch and urgency of the first half. In fact, the album ends with a wimper, the repetitive sounding Chico, and the lazy, uninteresting, ballad-esque We Were Young. Musically speaking, I am fully satisfied with this band. The guitar work is a treat to the ears, especially with the authentic, vintage sound the band has decided to go with. The lead vocalist has a perfect voice for this type of music. I would characterize his voice as a cross between Gene Simmons and Dave Wyndorf of Monster Magnet. Plenty of big riffs and catchy grooves populate the album. In particular, this allows most of the tracks from the first half of the album to becomes instantly infectious, demanding repeated listens. As I said earlier, the songs on the second half of the album aren't quite as catchy or memorable, although the excellent musicianship and vocals prevents them from becoming throwaways. I feel that the band may have been a little over zealous in placing 13 tracks on their debut album. Instead, chopping the three weakest tracks and releasing an album with a respectable 10 tracks may have been the better option. Nonetheless, I am excited with the ideas that the band has come up with on this album. Dirty Americans have the potential of cross genre fan appeal. From 70's party rock, to sleaze, to stoner, and even some psychedelic rock, there seems to be something to please a wide range of fans here. Furthermore, the band blends these elements without creating a choppy album, not do they sound like they're fishing for a sound. Personally, I'd like to hear the band maintain a high level of quality from start to finish, whereas the second half of their debut falls flat in spots. All in all, this is a very solid debut album, and if the band continue to improve, they will certainly develop a nice following.